After the Fiesta in Mexico, it’s Samba time in Brazil, and you would scarcely believe that it was 10 years ago that Lewis Hamilton and Felipe Massa had one of the most dramatic championship finishes in F1 history in Brazil – which Lewis Hamilton clinched the 2008 championship with seconds left of the race. And, as the F1 Bandwagon rolls into Sao Paulo, Hamilton has since added four more to his tally, including this year, sealing the title in Mexico last time out, as he did last year, and he will aim to do what he has been unable to do the last two times he has won the championship before the last race; win. Subconsciously perhaps, he switched off in 2015 and 2017 after winning the championship in both those seasons, and this trait is something that both Ferrari and Valtteri Bottas may be looking to capitalise upon in Brazil. Can Bottas finally win a race in what has been a desperately unlucky season for him, with strategies, punctures and team orders thus far costing him victories. However, with Hamilton already crowned, Bottas will surely be allowed to win should he be ahead. 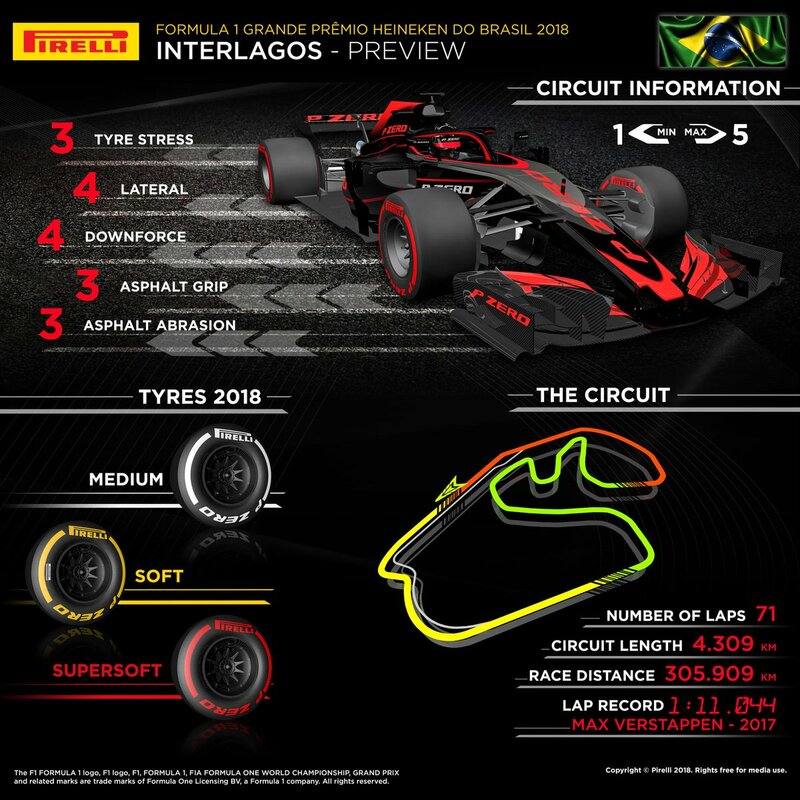 We arrive at the 4.3 kilometre Interlagos circuit, which is situated in a rainforest; this particular rainforest has tossed up all sorts of whacky races at the track since its F1 inception in 1973, creating intense championship showdowns in 2008 and 2012. This will be the first Brazilian Grand Prix in recent years not to feature a Brazilian driver, with Felipe Massa having retired from the sport last season. Considering the rich history Brazil has in F1, with incredible races along with some of the best racers F1 has ever seen, such as Emerson Fittipaldi, Nelson Piquet, and of course, the great Ayrton Senna – its quite sad not see a Brazilian replacement for Massa. Daniel Ricciardo’s Red Bull will be in Brazil, but whether it will take the Aussie to the chequered flag is another issue entirely. Despite his comments in Mexico, he will of course be racing in Brazil, but he and Max Verstappen are not expected to be in contention for victory, at a track with far better suits Mercedes and Ferrari. Ferrari took victory last year, with race winner Sebastian Vettel with third place going to Kimi Raikkonen sandwiching Valtteri Bottas. Hamilton missed out on a podium finishing 4th; due to a crash in qualifying, which meant he started the race from the pit lane due a gearbox and PU units change. With both the US and Mexico grandprix, Ferrari have found their form that deserted them pre spa. Even with Mercedes on the back-foot, they still have a fifty-five point advantage over the Italian team in the constructors championship. Besides the battle for the constructors, there is still a lot of pride at stake, Esteban Ocon will see this race as a hopeful audition for a seat at Williams alongside George Russell next year, Sergey Sirotkin will be hoping to show he deserves to stay at the British team, and Brendon Hartley is fighting to keep his drive at Toro Rosso. The Drivers’ championship may be over, but there’s still a lot that needs to be settled as F1 reaches the penultimate race of 2018. Next PostNext Thierry Neuville shares his thoughts on his year (so far) and his title hopes.